Adwords Call only campaigns are great for businesses who only want the phone to ring and don’t tend to spend so much time with emails. Click the new campaign button and select “Search Network Only”. On the right hand side, select “Call-only” and then update your campaign name. Scroll down and decide if you want search partners (not just google search) on your campaign. I normally update advanced location settings from “interested in” to “physically in”. When you scroll down you will come to how you want to bid, I have chosen cost per call at £10. Here you set your budget, you can change this later if needed. Delivery method is very dependent on your budget and targeting, I often go with accelerated but it is worth reading the definitions. As we have a campaign based on calls, your schedule is very important, make sure you can answer the calls if they come in. You can set popular times in bulk e.g. Mon-Fri 9-5 which I will show you. First you get rid of the existing ad schedule, so you can add a new one in. Click on “create custom schedule” and then you can add in the days and times you would like your ads to show. Ad rotation settings are well worth a read, but if you leave as default, this is unlikely to be detrimental. Click save & continue and you will be directed to create your first adgroup. There is some loading time here, due to the screen recording. You can name your adgroup here, this will likely be a particular theme of keywords. In the ad, you will have your business name and then phone number. As the headline is to call, you only need to create description ad copy, you do so here. Sometimes you need to test different combinations of words due to the character limitation. The display URL is what your potential clients see and the verification URL needs to have your phone number somewhere on the page so Google can verify it. If you leave call reporting on, your phone number will be dynamically replaced with a google forwarding number. This is what the ad looks like. You can enter your keywords here, but it is not mandatory if you just want to create the adgroup and ad at this stage. Click save adgroup if you are happy with everything above. Google is asking for a “http://” here. And your campaign is now created. You can click the various tabs to see your work. Well done for creating your first call only campaign! 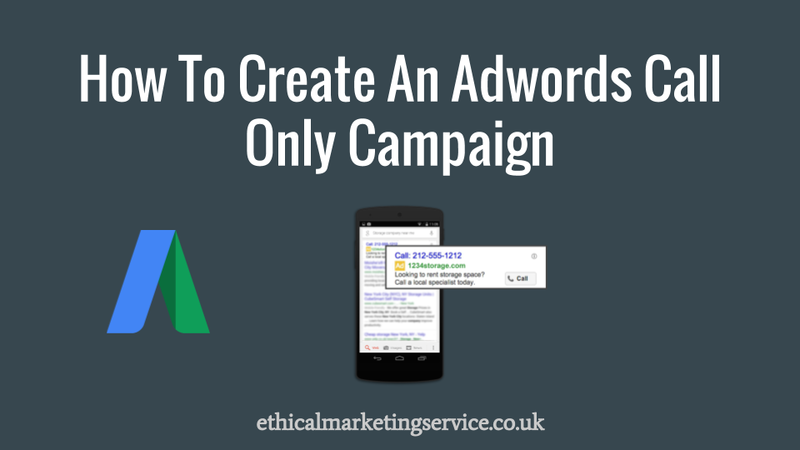 This entry was posted in adwords and tagged How To Create An Adwords Call Only Campaign. Bookmark the permalink.